BUY ITCaviar Pendant: Imagine these lighter-than-air pendants hovering above your dining table. A perforated metal cone contains the bulb, diffusing light into a million shimmering points. BUY ITCastore Suspension: Minimalists will love these streamlined yet decorative pendant lights. They lay low in the daytime but look spectacular in use, as the light within brings the frosted white surfaces to a gentle glow. BUY ITOcto Pendant: Truly, this famous design is sure to catch the eye of any Finnish design fan. This piece is the work of Seppo Koho, and belongs to a collection of similarly sculptural wooden pendants. BUY ITChasen S2: Patricia Urquiola’s gorgeous Chasen suspension lamp appears weightless thanks to its stainless steel frame that envelopes the frosted glass diffuser. BUY ITGrain Light: Chic as can be. This matte lamp series is made from recyclable materials like bamboo fiber. It’s distinctive texture looks and feels organic, ideal for a natural or soft kitchen style. BUY ITDiamond Lamps: Geometric motifs are still trending, and these diamond lamps are the perfect way to bring this exciting style to your kitchen. BUY ITSpillray Pendants: These delicate-looking pendants are made from durable Pyrex, its small bulb projecting from the silver finial. 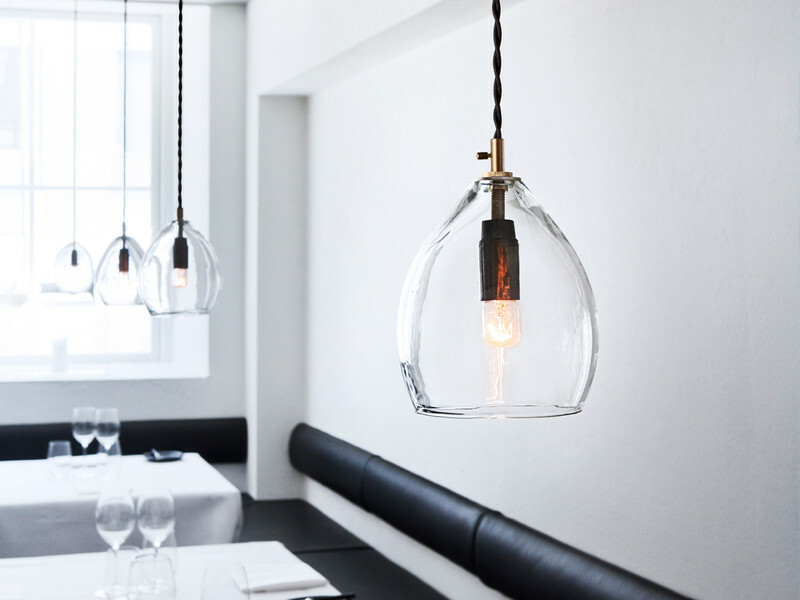 BUY ITOculo Pendant: Designed by Jeremy Pyles, this luxurious hand-blown glass lamps feature a rounded body that gently tapers to an opening at the bottom. BUY ITTalo Suspension: Simple, effective, and stylish – this linear suspension lamp maintains clean lines and refined forms to illuminate a kitchen island or workspace without drawing excess attention away from your meticulously curated interior. BUY ITPharos Pendant: Jeremy Pyles designed this stylish mini-pendant for those who have an eye for detail. Unlike others of similar form, this pendant has a light bulb that runs all the way through. 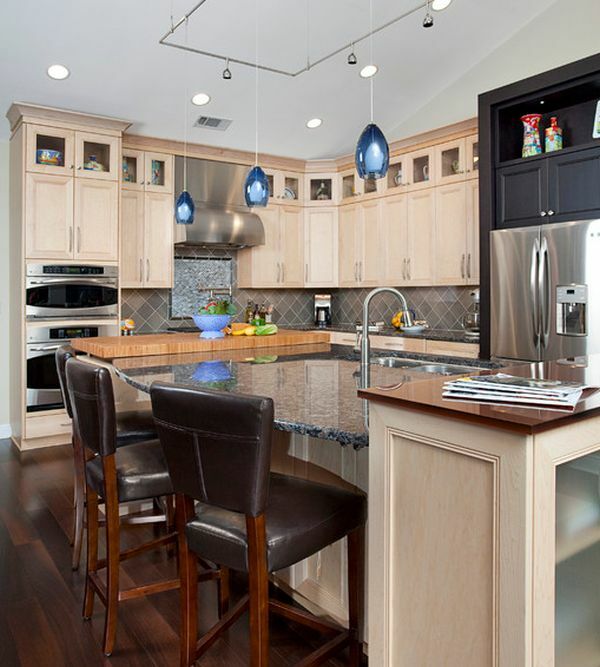 Kitchen lighting requires the careful consideration of two purposes. 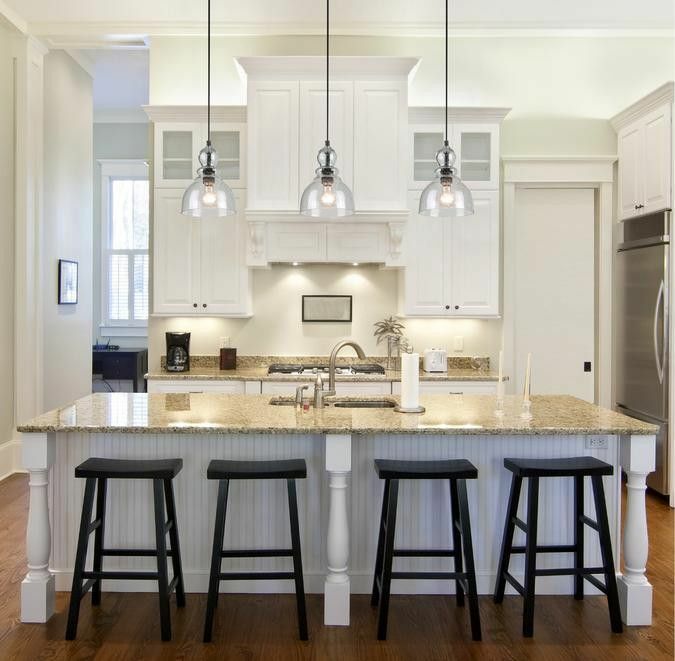 Ideally, it should illuminate the work surfaces where you conduct most of your preparation, and it should provide welcoming ambiance during dinner or evening hours. Pendants fill a special role in the kitchen, in addition to the two requirements mentioned previously – kitchen pendants are the preferred choice for decorators who want to make a creative statement in an otherwise utilitarian space, filling in the emptiness between the countertops and ceiling with suspended works of art. 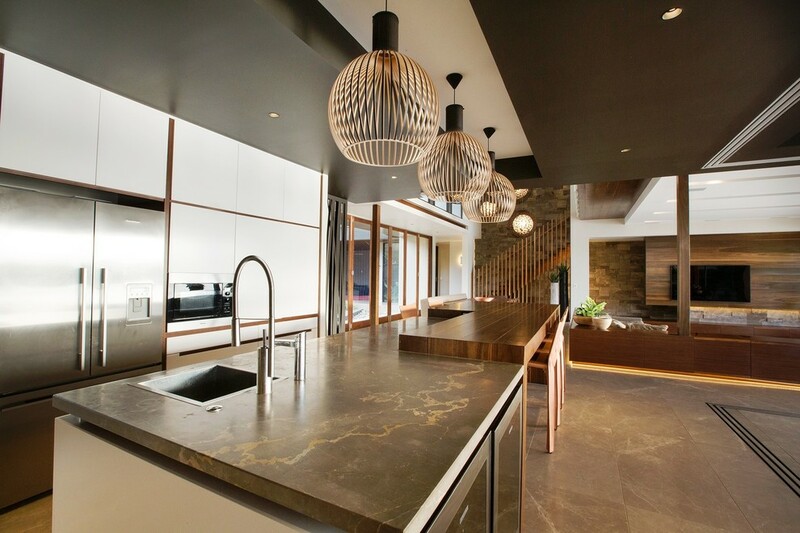 If you’re looking for kitchen inspiration, this modern lighting guide might help! BUY ITBroadway Collection: Looking for something a little more formal? James R Moder designed the gorgeous Broadway Collection with inspiration from classic chandeliers, streamlined to suit a modern kitchen. 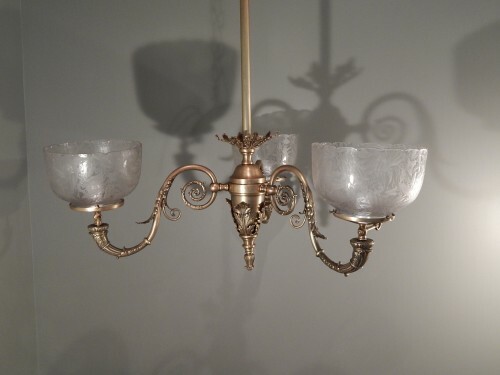 Imperial Crystal beads turn this fixture into a drama of light and shadow. BUY ITKon Pendant: Clear or ribbed or clear glass shades gifts decorators a nice choice of simple but attractive pendants. 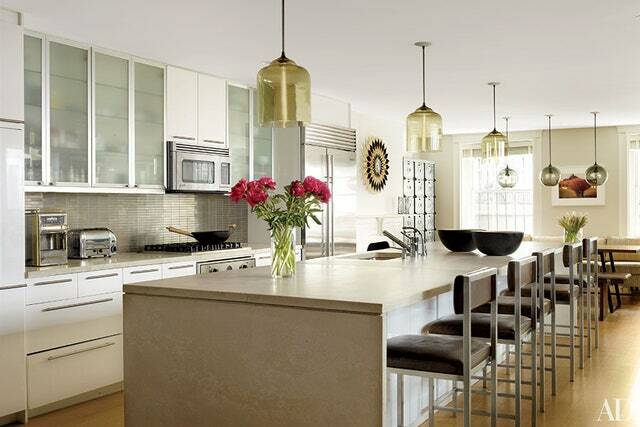 Metal details in chrome integrate well with almost any kitchen style. 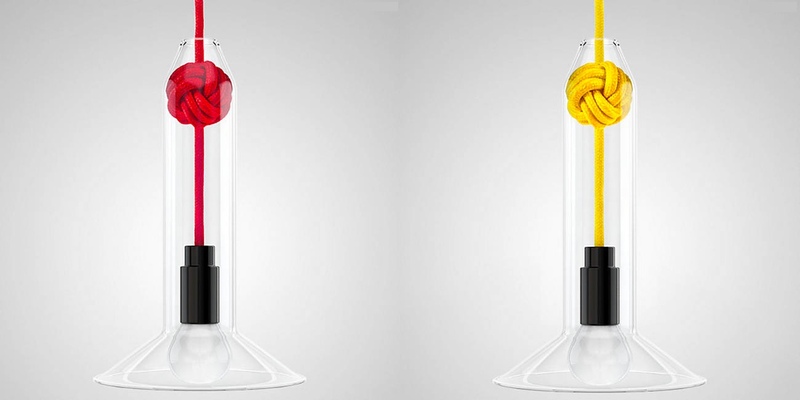 BUY ITKnot Pendant: Part fixture, part pop art – these tremendously unique pendant lights showcase a tidy oversized knot encased within the lamp’s glass shade. The range of bright colors can either enhance your current palette or stand out from within a neutral interior. BUY ITLames Mini Pendant: These low volt pendants give off a gentle and warm quality of light reminiscent of candles. BUY ITLe Klint 172: Designed by Poul Christiansen in 1971, this famous design makes an impact with shadow and light in equal measure. It’s origami-inspired artwork for the home. BUY ITBond Suspension Pendant: A slender gap winds its way around the lamp, illuminated by the bulb within. This pendant is unique in that it provides both diffused light for ambiance and focused light for tasks. BUY ITBloom Pendant: Glittering faceted flowers look as if they are woven together by nothing but air and imagination. The Bloom pendant looks great in kitchens inspired by nature, or could serve as the touch of organic charm that could benefit a space lacking in carefree forms. 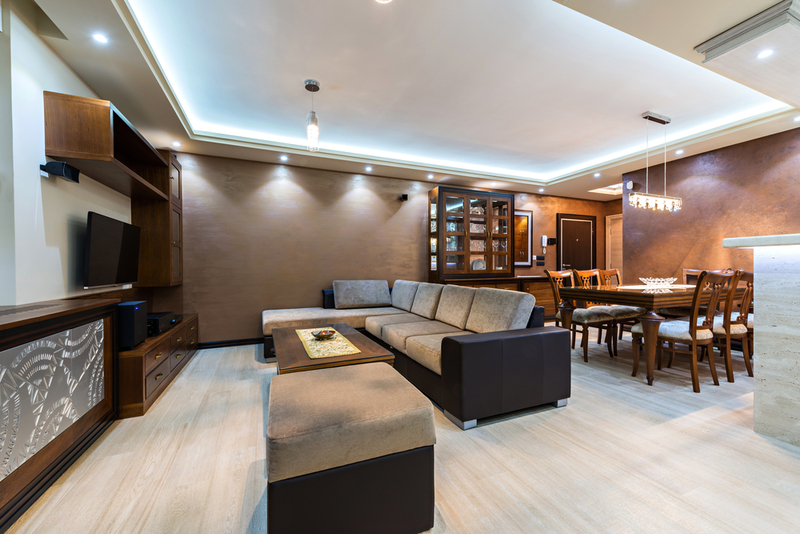 BUY ITSlim LED: Tall ceilings deserve gorgeous statement lighting. Designed by Jordi Vilardell for Vibia, these long and dramatic pendants transform empty space into performance art. BUY ITSummit Pendant: These conical pendants take on a thinner and more streamlined shape. They’re available in two sizes to accommodate any space. BUY ITCastle Pendant: Crafted from smooth concrete, these pendants challenge the eye by presenting a heavy material that looks light and versatile as any other option. BUY ITAplomb Replica: You might not have the budget to pick up Foscarini’s $665 original (available here), but this stylish modern look doesn’t have to remain entirely out of reach. BUY ITTom Dixon Copper Pendant: Copper is a warm and attractive choice for an interior that needs a touch of understated luxury. Tom Dixon makes a wide range of copper lighting, but these smooth and simple spherical pendants are perfect for kitchens and dining rooms. BUY ITPanton VP6: Now is your chance to own a Verner Panton original, one of the first lamps mass-produced by the iconic designer. Matte black makes a minimalist statement but this model comes in a wide variety of vibrant colors. BUY ITConic Section Pendant: Satin-finish black looks good just about anywhere. These flared mini-pendants have an angled shade that transitions to vertical wire toward the bottom for a dynamic look that changes according to perspective. BUY ITAlphabeta Pendants: With retro-inspired shapes and color themes, these playful pendant lights add huge personality to any social area. 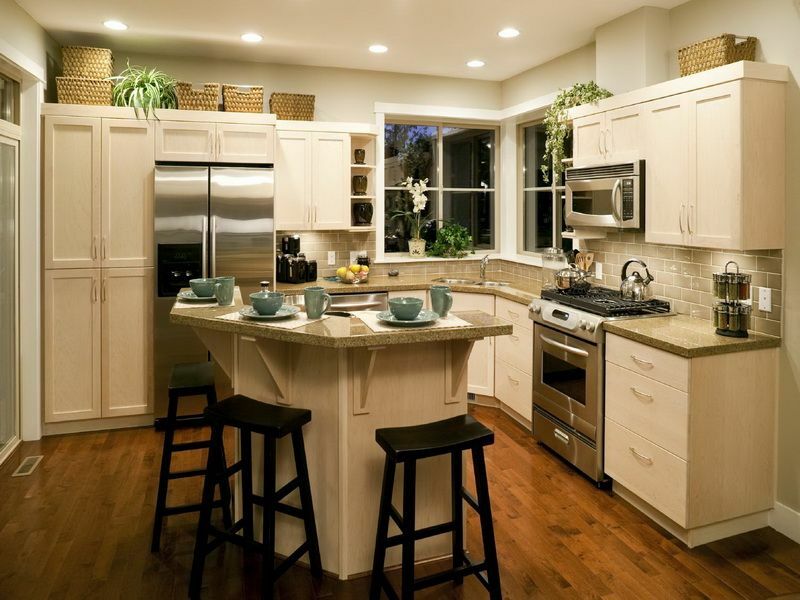 Use the variety of colors to unify the color theme in your kitchen. Made in Italy and designed by Luca Nichetto, these high-end lamps are beyond amazing. BUY ITRandom Globe Pendant: What an iconic lamp! The light and airy random pendant immediately draws the eye, and looks just as dramatic in the daytime as it does at night. BUY ITFucsia 1 Pendant: Conic lamps are another nice choice for kitchens that emphasize the clean lines and forms of minimalism. Fucsia pendants are a design by Achille Castiglioni. BUY ITSkygarden Lamp: This is one of the most recognizable designs by the ever-exciting designer Marcel Wanders. On the outside, this piece looks like an ordinary dome lamp but the inside features a detailed floral motif in plaster. 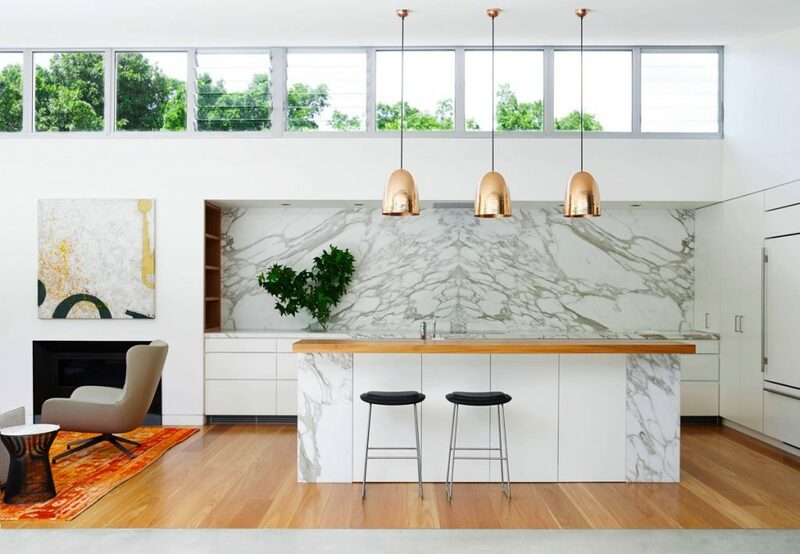 BUY ITCoral Pendant: Oversized pendants are a great choice for kitchens with tall ceilings, but they also work well in average spaces that need a solid focal point. Here, the unique Coral pendant prevents the fridge from stealing the show. BUY ITSmithfield S: The lovely Smithfield S pendant combines the best of dome lighting trends and low-profile design, adding subtle charm without blocking the view. BUY ITStudio Pendant: Thomas Bernstrand’s lovely Studio Pendant echoes the shape of heavy industrial lamps, a traditional shape reimagined with contemporary simplicity. BUY ITAgnes Chandelier Replica: This incredible chandelier is one of the most highly coveted pieces of designer lighting in recent memory. This replica is not inexpensive by any means, but it beats the $10,000 price tag of the Lindsey Adelman original. BUY ITAim Multi-Light Pendant: If you’re a huge fan of the designers Ronan & Erwan Bouroullec, you’re probably already familiar with the versatile and attractive Aim collection. The shades are adjustable to point in any direction for targeted task lighting in the kitchen. 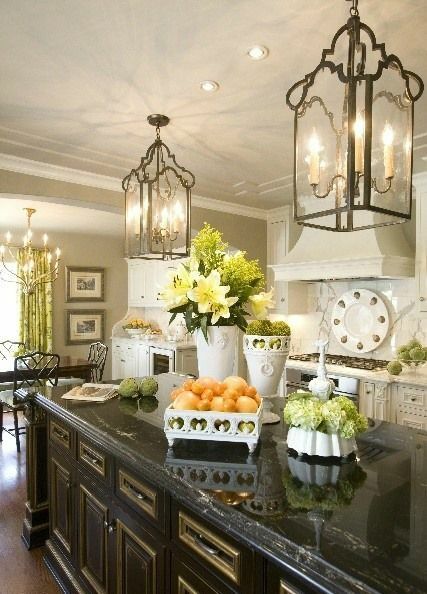 They just make this beautiful black and white kitchen come together. BUY ITMuuto Unfold Pendant: Unfold combines modern materials with a classic industrial shape. The Unfold pendant is available in a variety of modern colors, including several greyscale choices in addition to green, blue, and yellow. BUY ITRock Suspension: Faceted lighting presents a cool geometric look that works well for future-focused interior designs. This piece comes by way of collaboration between the Diesel fashion company and design house Foscarini. BUY ITStanley Pendant: Brass and copper have become an incredibly popular lighting trend for those who admire understated luxury. These pendants have a classic shape but a contemporary attitude. BUY ITFat Light Replica: Of all the shapes available in Tom Dixon’s iconic Beat collection, the Fat Light is a versatile favorite. Replicas are popular but you can purchase the original Fat Light for $535. 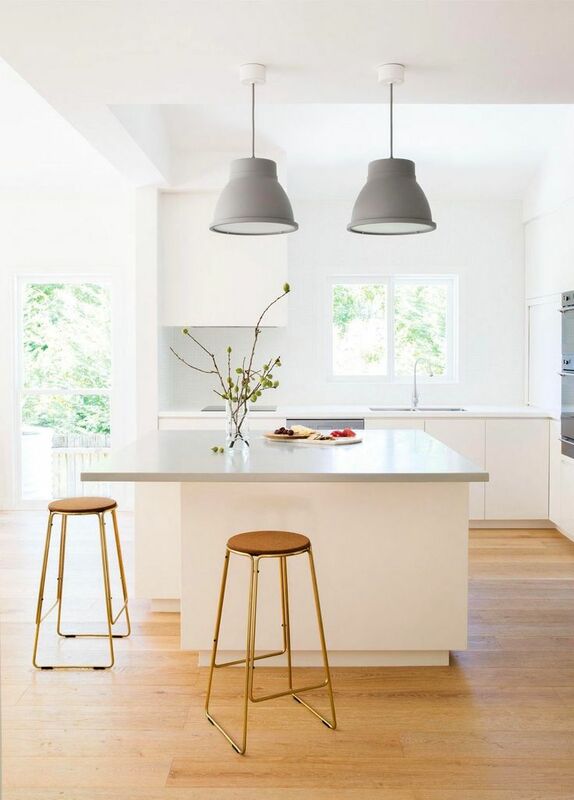 BUY ITBijou Pendant: Round, sensibly sized, and pleasant on the eyes – these understated pendants are a fantastic choice for minimalist kitchens. 42 | BUY ITSoleil Pendant: Here’s another sculptural glass pendant for decorators who prefer their lighting to make an artistic statement. These have a slightly more balanced and modern shape. BUY ITGoodman Large Lamp: Thomas O’Brien designed the Goodman lamp to demonstrate the best of modern and vintage style. The clean shades and metallic interior are undeniably contemporary, whereas the linked cable is a neat throwback to older lighting. BUY ITWireflow 2D: Another take on the geometric lighting trend, this series creates fabulous outlines using rods and its own wires. Wireflow is available in both 2-D and 3-D shapes. BUY ITHicks Pendant: Here’s another classically inspired pendant light, this time with the ever-recognizable chain style cord. BUY ITRoost Constellation Pendants: Zinc-plated iron globes feel light and transparent thanks to thousands of hand-drilled holes strewn across its surface like stars. 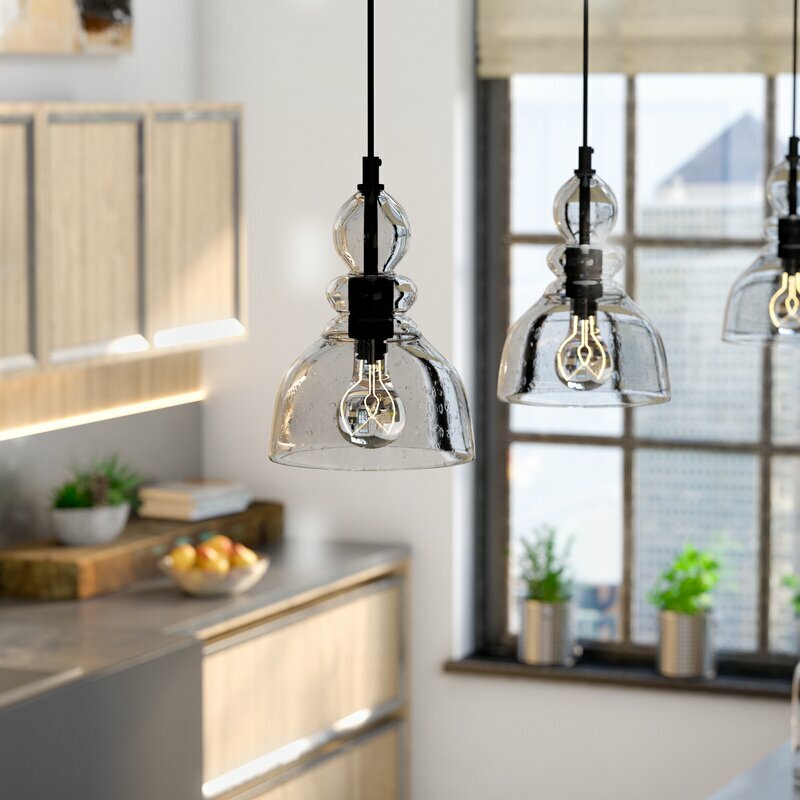 BUY ITIndustrial Pendant: Metallic pendants are a useful staple of industrial themes but they look great in any kitchen, as demonstrated by this classic interior. BUY ITCaravaggio Pendant: To honor its emphasis on light and shadow, designer Cecilie Manz named this pendant collection after the Italian Baroque painter considered a master of the style. BUY ITMhy Pendant: What a fun shape! This curvaceous pendant expresses the playful side of Scandinavian design, sure to make a statement wherever used – especially with any of the super vibrant color options. BUY ITAlina Pendant: Hand-blown lighting always makes a bold impression. 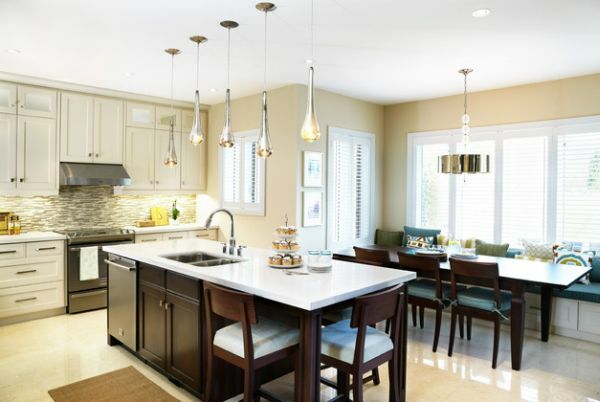 These honey toned Venetian glass pendants will add classic charm to any modernist or traditionally inspired space. BUY ITStarburst Multipoint Pendant: It’s hard to see from the picture, but each pendant shade contains a delicate glass starburst shape, lovingly formed by hand. The starburst portion is available in amber or clear glass for a choice between a warm or bright tone. BUY ITBeat Series Replicas: Varied pendants are a great look. This series of replicas makes it so much easier to collect each one. The originals Tom Dixon Beat Series are available here. BUY ITE27 Socket Pendant: With beautifully detailed Edison bulbs resurging in popularity, designers are beginning to turn more attention toward simple fixtures. Mattias Ståhlbom created the E27 socket pendant with an elegant form that highlights the bulb. This fixture is available in a wide range of colors.